Found only in the tropical forests of the Democratic Republic of Congo, okapis are similar in size and shape to a horse, but walk more like giraffes by moving front and hind legs of the same side simultaneously. Their diet consists of a wide variety of vegetation, including leaves, grass and shoots. Many of the plant species that the okapi feeds on are poisonous to humans. 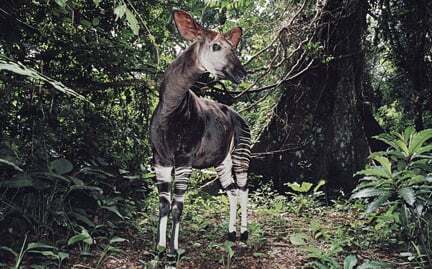 With such a limited range, habitat loss is a threat to the okapi.